Do You Have Lousy Animals? As we enter the colder, darker, damper time of year, we will be re-visited by a pest from the past: lice. An annual problem, lice can affect animal health and farm profitability. Here is a short primer on this parasite. 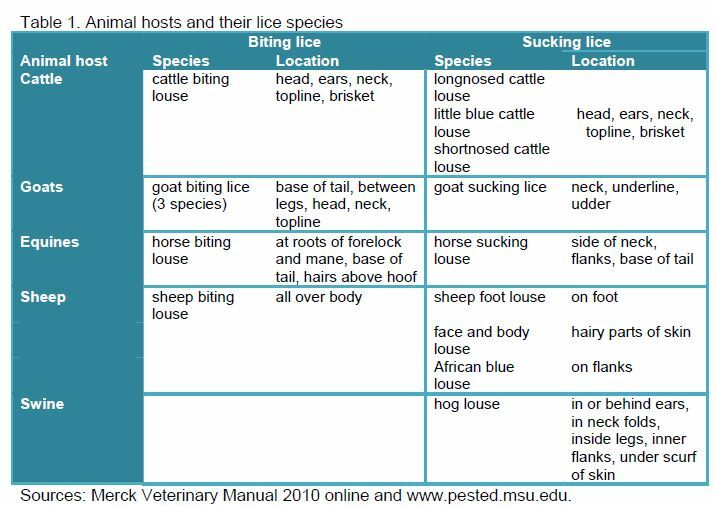 Lice are generally quite species specific (Table 1). This means poultry lice won’t spread to cattle or people and vice versa. Sheep and goats can share some lice species, however. The table lists primary locations of particular lice on their host, but keep in mind that when lice numbers are very high, they may be found anywhere on the body. The entire life cycle of most lice species takes about a month and occurs on the host. Adults and nymphs that fall off the host do not survive beyond a few days. Adults feed for about a month, then lay eggs (“nits”) and die. Nits are attached tightly to hair shafts. Eggs hatch in one to three weeks and the resultant nymphs metamorphose into adults. Adult biting lice and nymphs eat dead skin cells, hair and other debris found on skin; adult sucking lice and nymphs penetrate skin and consume blood. Most experienced livestock owners are well acquainted with the signs of lice infestation: rough coat, hair loss, scratching, irritated skin, secondary skin wounds and infections, weight loss and general restlessness. Occasionally, afflicted animals develop problematic hairballs from licking themselves excessively and ingesting hair. Heavy infestations of sucking lice can result in clinical anemia and even death, especially in young animals. Lice can sometimes transmit disease-causing agents, such as rickettsia. They can also debilitate animals enough to predispose them to secondary problems such as pneumonia. If lice don’t live off the host very well and they aren’t a problem in summer, why are they a problem every winter? 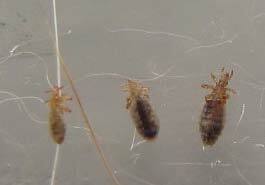 Some “carrier” animals may harbor small populations of lice year-round. When it gets to be a louse’s favorite time of year (dark, cold and damp), animals are usually in close contact to stay warm, making it easy for lice to move between animals. Carriers give managers another reason to closely inspect any new animals brought into a herd; consider lice treatment as something to add to your quarantine procedure. animal’s muzzle, feet, legs, udder and groin areas. When in doubt, use sticky tape to capture a specimen and take it to your veterinarian for identification. Lice treatments come in many forms including sprays, pour-ons, dust bags, back rubbers, drenches, dipping vats and even injections for some lice species. Examples of treatments for different animal hosts appear in Table 2; your veterinarian may recommend extra-label use of other medications if a valid veterinary-client-patient relationship exists and proper record keeping is conducted. For all products, be sure to follow label instructions. Theoretically, treating all livestock at the same time and re-treating two to three weeks later and moving to a clean environment should break the lice cycle. However, an infestation can persist if dusting powder is used and lice on an animal’s underbelly escape treatment or if nits on shed hair are transported to a new site via clothing, wind, equipment etc. lice per square inch of skin. Lice populations will naturally decline when environmental temperatures are consistently over 60°F. Excellent nutritional programs have been shown to make livestock more resilient to lice infestations. Use pesticides with care. Apply them only to plants, animals, or sites listed on the label. When mixing and applying pesticides, follow all label precautions to protect yourself and others around you. It is a violation of the law to disregard label directions. If pesticides are spilled on skin or clothing, remove clothing and wash skin thoroughly. Store pesticides in their original containers and keep them out of the reach of children, pets, and livestock. Cooperating agencies: Washington State University Extension, U. S. Department of Agriculture, and Washington counties. WSU Extension programs and employment are available to all without discrimination. Evidence of noncompliance may be reported through your local WSU Extension office. This information given herein is for educational purposes only. References to commercial products or trade names is made with the understanding that nondiscrimination is intended and no endorsement by WSU Extension is implied.